Character: Very friendly with human, might bite if u try to hit him. think been abuse before. overall is a good dog. but not sure whether he can be with other dog. but so far haven fight but bark at the dog. Reason for giving up: Is a found dog. Currently at my friend's pet shop. has been days and didn see any notice of lost dog. we cant keep it for long. finding adopter or foster. no microchip. hind leg got wound but recovering. VERY FAT. lol. he on diet now cause he refuse to eat knibbles..but of course he got eat when he is very hungry. 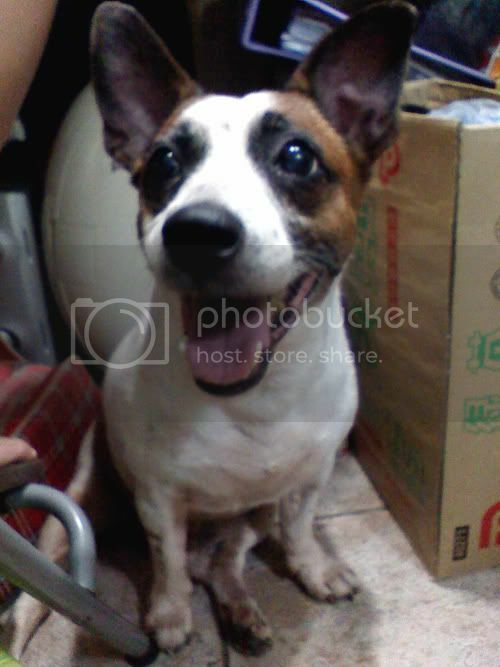 u may contact May at 81212981.
he was found on 02 may 09 at bukit gombak (bukit batok) if anyone hu knows ur friends hu lost a jrt in that area same as the dog in the photo PLEASE contact us!! (: we cant keep it for long.